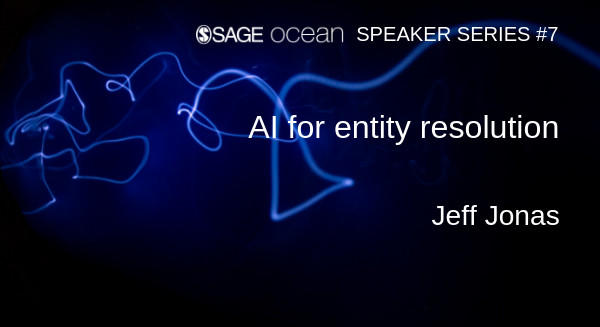 At the start of 2019 we were thrilled to be joined by acclaimed data scientist Jeff Jonas, the world’s foremost expert on entity resolution (ER) as part of the SAGE Ocean Speaker Series. Unsure what entity resolution is? Jonas defines ER as ‘recognizing when two observations relate to the same entity despite having been described differently. And conversely, recognizing when two observations do not relate to the same entity, despite having been described similarly’. Examples of entity resolutions might be: duplicates in your address book or duplicates across your company’s customer database. Get the full rundown on entity resolution from the world’s foremost expert via our video below. If you're interested in speaking at one of our future events and engaging with the social science, publishing and tech communities in London, we'd love to hear from you. Please send us a message and we'll get back to you with more information.